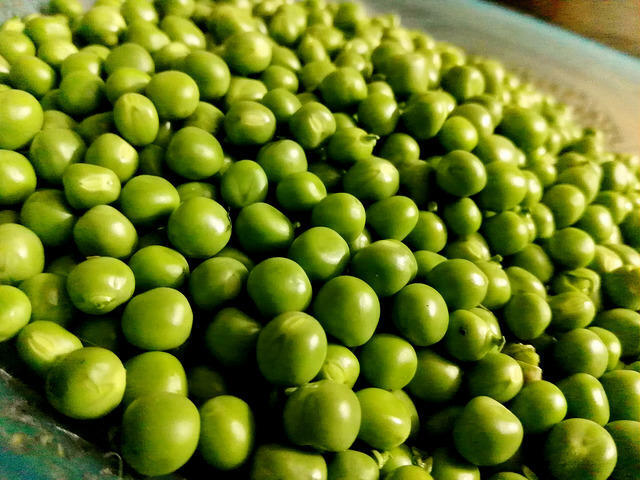 We're lucky that here in Baltimore we can get fresh peas at our farmers markets. Tom McCarthy, the famous "Pea Man" is celebrated for the quality of his peas, and the speed with which he sells out. And we should mention that he sells a wide variety of fresh beans as well. The SIMPLEST way to serve peas is simply to blanch them briefly and serve them with your best butter. But if you take that simple approach just one step further, you can amp up your dish. Just sauté some finely chopped onion and some minced garlic in olive oil over low heat. Stir in a quarter cup of chicken broth and add your peas. Cook gently until the liquid is reduced, and season. Simple and good. My mother used to make a wonderful dish with blanched small white creamer potatoes, simple béchamel sauce and peas. She'd always season with a little salt and pepper plus a dash of nutmeg, which may explain my weakness for that spice. Peas, ham, cheese and pasta have a strong affinity for each other. Pick a pasta, pick a meltable cheese, pick any form of cured ham you want, and bingo, you have the start of a nice dish. Toss it some red peppers for color, some asparagus slices for contrast, maybe some cherry tomatoes for a juicy bite, and you've got a lovely, quick dinner. Let's get a little more ambitious and try a deconstructed lasagna. For the pasta you can break up sheets of raw uncooked lasagna; boil that. For the veggies, you can use peas, scallions, and julienne slices of arugula; sauté lightly. For your cheese, blend some fresh pesto into ricotta cheese, along with just a little cream and heat it. Once cooked, toss all the ingredients together and sprinkle with a dusting of parmesan cheese. And you'd best have a cold, dry white wine with this one. 1. Combine garlic, parsley, 1 tablespoon oil, a pinch of salt and 1/2 cup water in a small saucepan. Add peas and cook over medium heat, stirring occasionally, until peas are tender. Drain and reserve the cooking liquid. 2. Transfer pea mixture to a food process, and pulse until a coarse paste forms. Transfer to a medium bowl. Mix in chives, 1/2 tablespoon of the lemon peel, 1 tablespoon of lemon juice, 1/2 teaspoon of the red pepper flakes, and 2 tablespoons of oil. Stir in the reserved cooking liquid until the mixture is thick but spreadable. 3. Sprinkle oil on the toast slices, then spread the pea mixture. Garnish with a little more pepper flakes and more oil.